Proof that sometimes dedication can be a scary thing. Dungeons & Dragons director Courtney Solomon liked the role-playing game so much that he bought the movie rights to it when he was 19 years old. The next ten years he spent looking for suckers, er I mean, backers for the movie. Now, I’ve never played Dungeons & Dragons (is this game still popular or has it been superseded by the likes of Magic – the Gathering? ), but there is nothing in this 2000 screen adaptation to make me change my mind. Instead it seems to prove that not only does computer games make for bad movies, but so does any other type of game. Chances are fans of the game would also be embarrassed by this movie. Maybe because it seems to be more inspired by the likes of Star Wars and Raiders of the Lost Ark than any fantasy-based game. But like I’ve said, I’ve never played the game: the movie’s problem could also be that it is too true to its source material. I don’t know. Dungeons & Dragons is funny in a so-bad-it’s-good manner. First, the acting is over-the-top, particularly Jeremy Irons whose over-the-top acting makes Lance Henriksen’s turn in Knights (which I’ve recently seen) look like the very model of restraint in comparison. Irons is so over the top that I often found myself merrily chuckling in mirth. Okay, the dialogue consists of terrible clunkers so Irons probably decided to have some fun. In retrospect he is the best thing in the entire movie. As Jessica Rabbit said of Roger Rabbit: he makes me laugh. 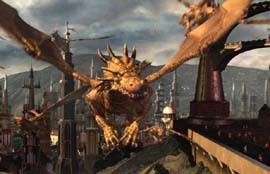 Second, the special effects (and make no mistake this film is driven by them) are particularly bad with CGI effects that are so obviously fake that it looks like some cheap computer game from the previous century. Particularly the climax with dragons battling it out with wizards (called mages in this pic) is let down by cheesy CGI reminiscent of the type we saw in Spawn. Third, it isn’t particularly original, but at least the production designs are better than expected and Dungeons & Dragons doesn’t drag on for too long (the second half does get a bit long-winded though). Nor does it spend too much time on endless board meetings and a wooden unbelievable love affair. There, I’ve said it: I still like it better than Attack of the Clones . . .